He rakau nui I wao nui Tane. To blossom, to grow and to be fruitful. To become a great living tree in the world of Tane. With great thanks to all the beings and all the helpers and all the tour members for this magic time! This ten days journey was about returning home to Aotearoa "the land of the forever radiant light", to receive the messages revealed by nature and to feel what radiates through the Maori culture. 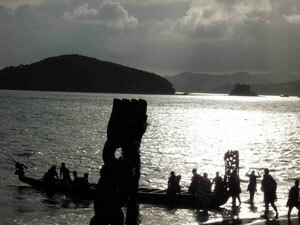 We experienced the great gathering of Maori people in Waitangi during Waitangi day, the national holiday. We visited the 90-Mile beach and stayed together in a beautiful Marae. Then we followed the ancestor path to "Te Rerenga Wairua", the most northern point of New Zealand, where the souls dive under the water to find their way home to Hawaiki Nui. At the ancient tree Tane Whakapiri, the God of the forest, who binds all together, the journey's stories all got woven together. We danced and sang, made our own Poi and learned to weave our own KITE, gathered seafood and shared the Maori healing of RomiRomi with Atarangi. We experienced the Maori culture from many different sides and spent time in wonderful places on magical beaches.